When my father was on that flight home from London, Libya’s new ruler, Muammar Qaddafi, promoted himself from captain to colonel and issued orders that senior military officers be arrested. My father was taken straight from the Tripoli airpot to prison. Five months later, he was released and stripped of his rank and uniform. He returned to his wife and three-year-old son, Ziad. The new regiime then did with my father what it did with most officers who were high-ranking under Idris. Not wanting to make enemies of senior military men, yet at the same time fearing their potential disloyalty, it sent them abroad, often as minor diplomats. This allowed time for the new security apparatus to form. My father was given an administrative role in Libya’s Mission to the United Nations soon after his release. 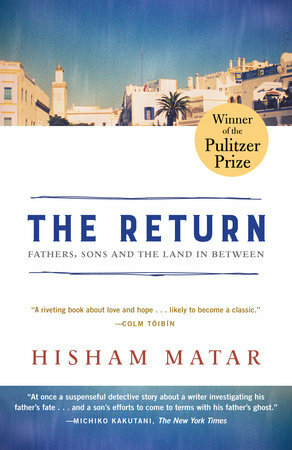 I was conceived in that short window of time between my father’s release and his departure for New York: a time of uncertainty, but also a time of optimism, because, as his retelling of the embassy story suggested, Father had high hopes for the new regime. Maybe he saw his imprisonment, removal from the army and temporary banishment as natural repercussions—perhaps even reversible—of the country’s historical transformation. He, like many of his generation, was inspired by the example of Egypt, where, led by Gamal Abdel Nasser, a young, secular and nationalist pan-Arab republic replaced a corrupt monarchy. Qaddafi had declared his admiration for Nasser, and Nasser gave his full support to Qaddafi. So, as reluctant as my father must have been to leave Libya, I don’t imagine he went to New York in despair. It took a couple of years—after Qaddafi abrogated all existing laws and declared himself de facto leader forever—for Father to discover the true nature of the new regime. Even he, with his intolerance for superstition, must have sense an ill omen in an event that took place on his first day at work in New York. Crossing First Avenue towards the UN building, my father saw a lorry collide with a cyclist. The limbs of the cyclist were scattered across the asphalt. My father’s response was to collect the pieces of flesh and bone and respectfully place them beside the torso, which, like the twisted bicycle, had landed on the pavement. I have always associated the irrevocable and violent changes my family and my country went through in the following four decades with the image of my father—a poet turned officer turned, reluctantly, diplomat—dressed in a suit and tie, far away from home, collecting the pieces of a dead man. He was thirty-one years old. I was born later that year.